Look at what these hunters stumbled onto while planting a duck hole last season. Cottonmouths (AKA water moccasins) typically grow to between 30 and 48 inches, occasionally as long as 74 inches long, according to the Smithsonian National Zoo. How long do you think “Cottonmouthzilla” is judging from the video? 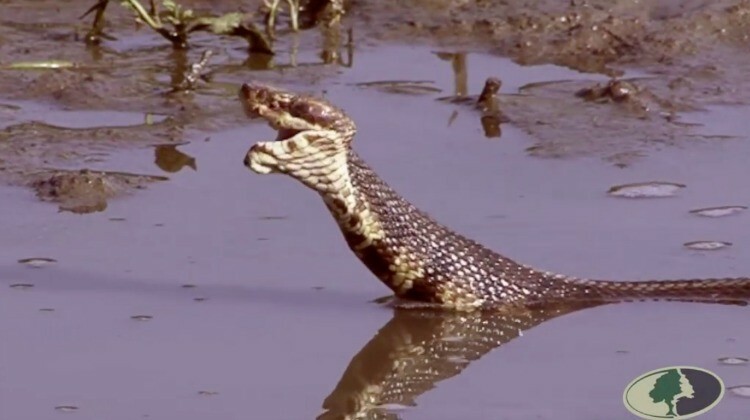 Water moccasins are highly venomous and are known to stand their ground when they feel threatened. This specimen, however, appears to be so thick and massive that it’s hard for the creature to even get around. Little is known about the typical life span of one of these snakes, but you can only image that this one is several decades old. It must weigh in at of 100lbs!